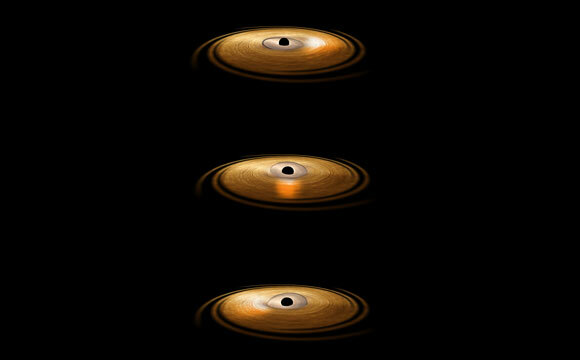 This artist’s impression depicts the accretion disc surrounding a black hole, in which the inner region of the disc precesses. “Precession” means that the orbit of material surrounding the black hole changes orientation around the central object. Using data from XMM-Newton and NuSTAR, astronomers have proved the existence of a “gravitational vortex” around a black hole. This new discovery, aided by NASA’s Nuclear Spectroscopic Telescope Array (NuSTAR) mission, solves a mystery that has eluded astronomers for more than 30 years, and will allow them to map the behavior of matter very close to black holes. It could also open the door to future investigations of Albert Einstein’s general relativity. The phenomenon was dubbed the Quasi Periodic Oscillation (QPO). “It was immediately recognized to be something fascinating because it is coming from something very close to a black hole,” said Adam Ingram, University of Amsterdam, the Netherlands, who began working to understand QPOs for his doctoral thesis in 2009. During the 1990s, astronomers had begun to suspect that the QPOs were associated with a gravitational effect predicted by Einstein’s general relativity: that a spinning object will create a kind of gravitational vortex. “It is a bit like twisting a spoon in honey. Imagine that the honey is space and anything embedded in the honey will be “dragged” around by the twisting spoon,” explained Ingram. “In reality, this means that anything orbiting a spinning object will have its motion affected.” In the case of an inclined orbit, it will “precess.” This means that the whole orbit will change orientation around the central object. The time for the orbit to return to its initial condition is known as a precession cycle. “We have spent a lot of time trying to find smoking gun evidence for this behavior,” said Ingram. Because the accretion disc is rotating, the iron line has its wavelength distorted by the Doppler effect. Line emission from the approaching side of the disc is squashed — blue shifted — and line emission from the receding disc material is stretched — red shifted. If the inner flow really is precessing, it will sometimes shine on the approaching disc material and sometimes on the receding material, making the line wobble back and forth over the course of a precession cycle. Seeing this wobbling is where XMM-Newton came in. Ingram and colleagues from Amsterdam, Cambridge, Southampton and Tokyo applied for a long-duration observation that would allow them to watch the QPO repeatedly. 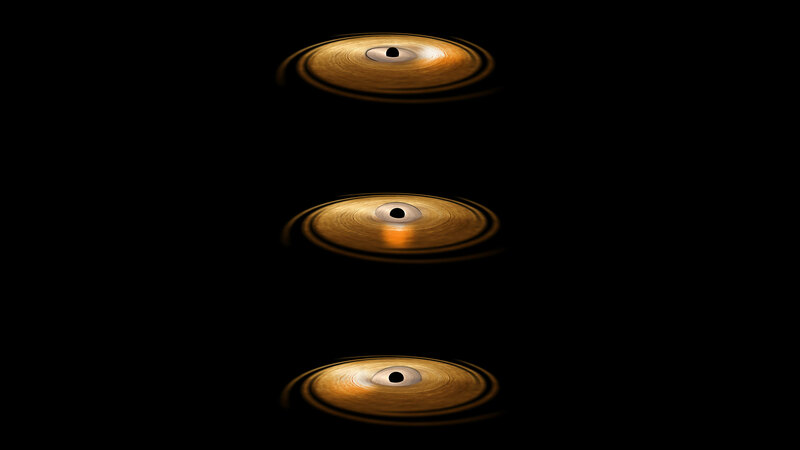 They chose black hole H 1743-322, which was exhibiting a four-second QPO at the time. They watched it for 260,000 seconds with XMM-Newton. They also observed it for 70,000 seconds with NASA’s NuSTAR X-ray observatory. After a rigorous analysis process of adding all the observational data together, they saw that the iron line was wobbling in accordance with the predictions of general relativity. “We are directly measuring the motion of matter in a strong gravitational field near to a black hole,” says Ingram. Einstein’s theory is largely untested in such strong gravitational fields. So if astronomers can understand the physics of the matter that is flowing into the black hole, they can use it to test the predictions of general relativity as never before – but only if the movement of the matter in the accretion disc can be completely understood. “If you can get to the bottom of the astrophysics, then you can really test the general relativity,” says Ingram. A deviation from the predictions of general relativity would be welcomed by a lot of astronomers and physicists. It would be a concrete signal that a deeper theory of gravity exists. Larger X-ray telescopes in the future could help in the search because they are more powerful and could more efficiently collect X-rays. This would allow astronomers to investigate the QPO phenomenon in more detail. But for now, astronomers can be content with having seen Einstein’s gravity at play around a black hole. “This is a major breakthrough since the study combines information about the timing and energy of X-ray photons to settle the 30-year debate around the origin of QPOs. The photon-collecting capability of XMM-Newton was instrumental in this work,” said Norbert Schartel, ESA Project Scientist for XMM-Newton. 2 Comments on "Astronomers Prove the Existence of a “Gravitational Vortex” Around a Black Hole"
Who said that Black Hole is an Hypothesis? What other explanation can you give for the energy of Black Hole to sling around all the galaxies and stars about it ? Even Dalton Atomic Theory also was only a hypothesis. Could it be ignored then ? Dalton did not live to see the discovery of proton which came later from Alpha scattering. Bohr also made a theory with the algebra known to him at that time. Has it not come true? Darwin’s theory of evolution is once again a theory but could not be discarded. To prove the theory of evolution he should have lived for a million years in his experiment to show that animals change their metamorphosis. But later discovery of DNA and its mutations hold the theory to be good. A hypothesis can be dismissed only if it is proved otherwise. Thank You.